Boundaries, districts, reserves, parks, sanctuaries, towns, etc. 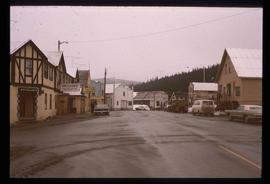 Image depicts a street in Wells, B.C. 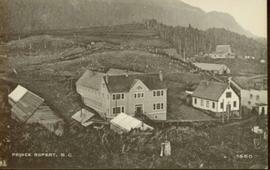 The Wells Hotel is present in the image. Consists of 2 overlapping legal-size copies depicting the plans for Lot 7392 in Port Essington. Handwritten annotation on verso reads: " '[Naskeena?' anchored off Metlakatla with Dr. [Mc-?] & Capt. 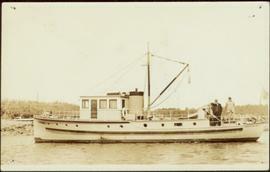 Barry standing on its deck". 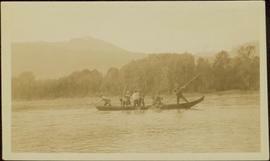 Canoe with mast floats close to shore in foreground, mountains visible across river in background.Handwritten annotation on verso reads: "Arch. W.H. 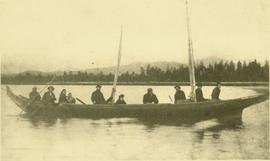 Collison & wife with native friends en route up Skeena River." Photograph depicts a man and woman standing on steps to a round tower in fenced area. 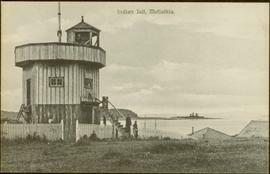 Roofs of other buildings can be seen below on right; water and shore visible in background.Printed on image: "Indian Jail, Metlatkla". 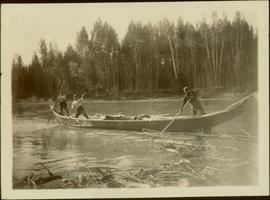 Five unidentified men sit with dog in canoe. 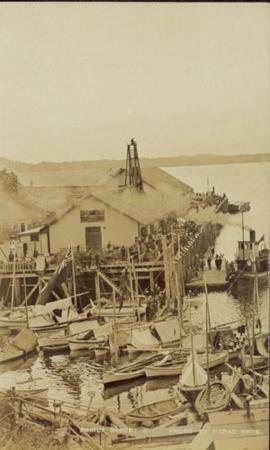 One man stands on dock in foreground.Handwritten annotation on verso reads: "Freighting by canoe on skeena river". Consists of 9 legal-size copies of documents related to the surveying and preemption of land at Port Essington by Robert Cunningham. 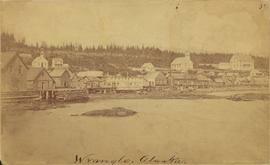 Photograph depicts town buildings on opposite shore. 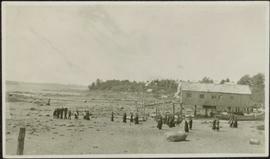 Beach and dock can be seen in foreground.Handwritten annotation on verso reads: "Chapter XXII, No 1. Eastern Section of Port Simpson as christianized." 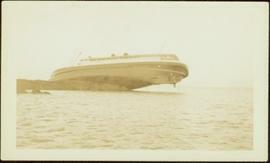 Photograph depicts ship resting almost entirely out of water.Handwritten annotation on verso reads: "A slight steering problem? 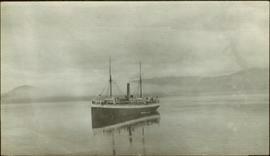 Union SS Catala on reef off Port Simpson". Totem poles (crest poles?) stand in front of remains of wood structures built along sandy shore. 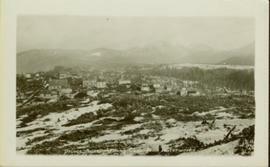 View from above, forest on hill in background.Handwritten annotation on verso reads: "[? illegible] Deserted village West Coast QCIs." 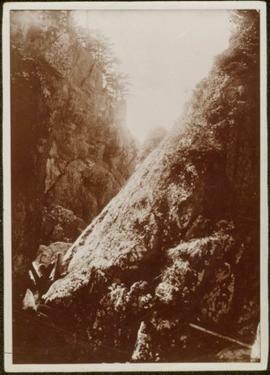 Photograph depicts narrow valley between steep cliffs.Handwritten annotation on verso reads: "on left Vertical side of old Indian fort at Nagas W. Coast Q.C.I". Handwritten annotation on verso reads: "Poling supplies up Nass River". 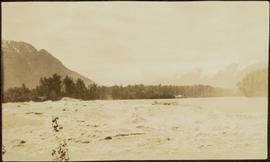 Handwritten annotation on verso reads: "Travelling thru' canyon on Nass River 'Engine & poles'".Hill on opposite shore in background. 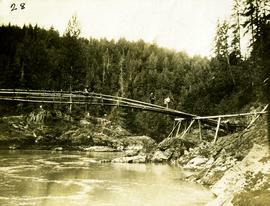 Three men can be seen carrying bundles across bridge above river, forest on shore in background.Handwritten annotation on verso reads: "Upper Nass River. Chapt. XXII. No. 4. An Indian Bridge on a canyon." Handwritten annotation on verso reads: "Lower end of canyon on Naas River. North of Prince Rupert". Forest and mountains visible on shore in distance. Forest and hills on opposite shore in background. Handwritten annotation on verso reads: "Lava plain Upper Nass River". Forest and hills visible in distance across plain. Handwritten annotation on verso reads: "High water on the Nass River". Tree branches in foreground, forest and mountain visible on shore in background. 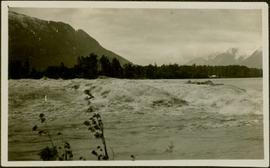 Handwritten annotation on verso reads: "Nass River canyon at flood water". A building is visible on shore in distance, and mountains can be seen in background. 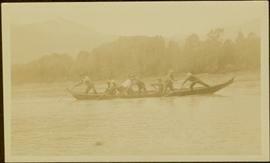 Forest and hills on opposite shore in background.Handwritten annotation on verso reads: "poling canoe up Nass River". 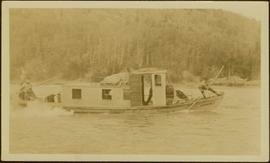 Tugboat appears to be towing a long line of small boats.Handwritten annotation on verso reads: "Fishing fleet coming home Nass River B.C." 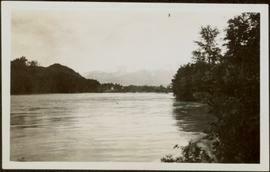 Photograph depicts buildings on shore in background, hills visible in distance.Handwritten annotation on verso reads: "1st canyon Nass River". 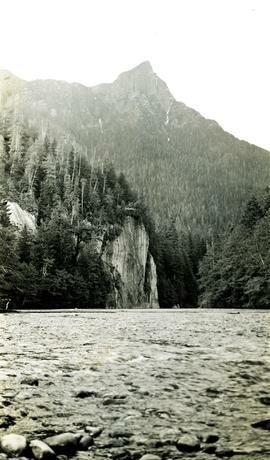 Photograph features a steep cliff across water, rocky shore in foreground.Handwritten annotation on verso reads: "Up the 'Big Creek' at Kincolith B.C. 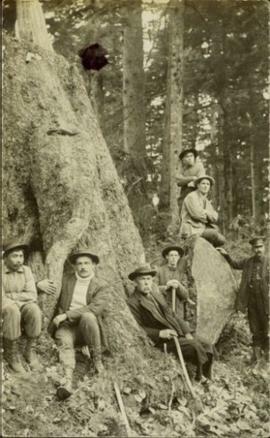 Rock face called 'the place of echoes' by the Indian people." 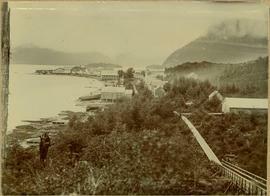 Hills on opposite shore in background.Handwritten annotation on verso reads: "Early steamship off mouth of Nass River". Handwritten annotation on verso reads: "Canyon on Nass River". Forest and mountains visible on shore in distance. 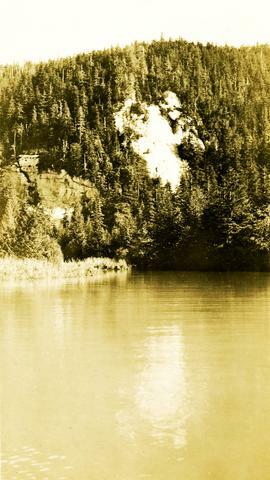 Photograph features a steep cliff across still water.Handwritten annotation on verso reads: "Place of Scalps / Kincolith BC"
Child stands in distance beside tall totem pole. 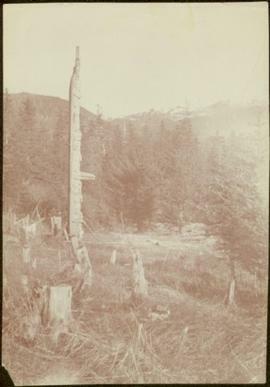 Tree stumps in foreground, forest and mountains in background.Handwritten annotation on verso reads: "[Sanabati near Upper Queen?] Kasaan Alaska". 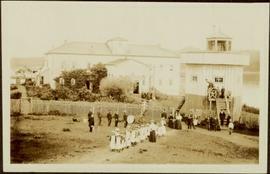 Large crowd is gathered around main building in a harbor. Many boats visible in foreground. Smoke from tugboat partially obscures the scene. 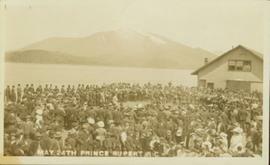 Annotation on recto reads: "Prince Rupert BC. 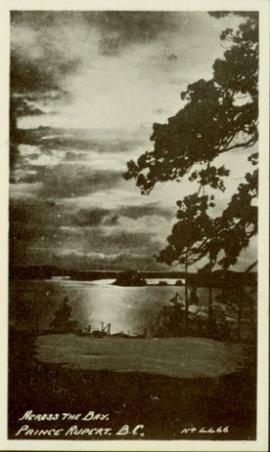 Photo by MCrae Bros."
Photograph of the bay at dusk. Trees and distant machinery are silhouetted against a cloudy sky and dark waterfront. 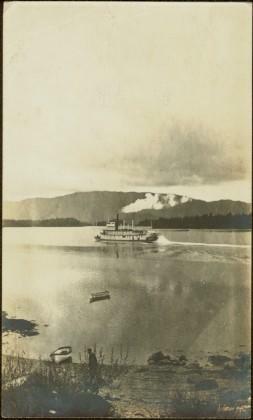 Annotation on recto reads: "Across the Bay, Prince Rupert, BC No 4466." 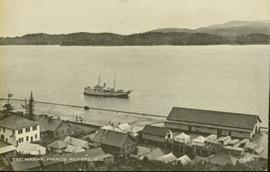 Wide angle photograph of Prince Rupert sometime during the winter. There is snow on the ground and a marge mountain range is visible in the background. 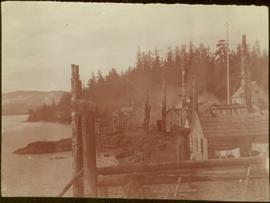 Annotation on recto reads: "Prince Rupert looking East from Waterworks J.D.A Pho 5/2." Wide angled photograph of a sunset on the waterfront in Prince Rupert. Several buildings are silhouetted in the foreground. 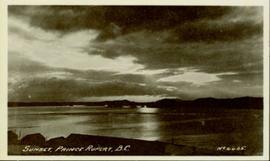 Annotation on recto: "Sunset, Prince Rupert, BC No. 4465." Totem poles (crest poles?) 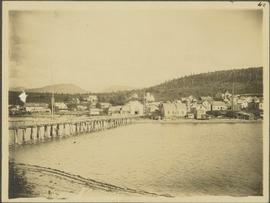 stand in front of wooden houses on right. 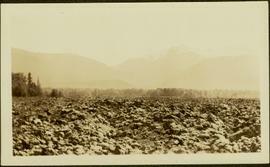 Hills on shoreline visible in background.Handwritten annotations on verso read: "West Coast QCIs. "; "[Old?] Kassan Alaska." Close up photograph of a large residential building in a freshly clear cut area. 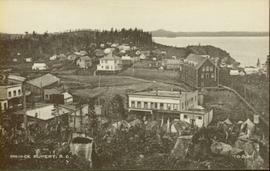 To the right of the main building is the church and an unidentified commercial building. Annotation on recto reads: "Prince Rupert, BC 1660." Wide angle view of mountains and small residential buildings. A large dock is visible in the foreground. 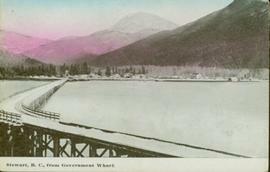 Annotation on recto reads: "Stewart, BC., from Government Wharf." 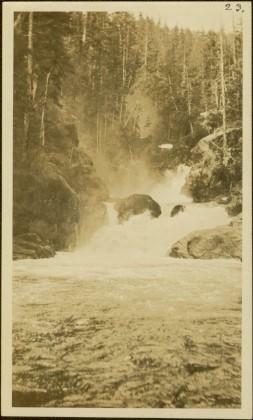 Photograph features rapids in foreground, trees and rocks in background.Handwritten annotation on verso reads: "A waterfall on American side of the Canal. Chapt. 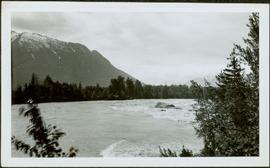 XXVI Waterfall on Alaskan side of Portland Inlet." Photograph of large crowd spanning the frame of the photograph. A large marching band is visible along the edges of a small clearing in the centre. Annotation on recto reads: "May 24th Prince Rupert BC." 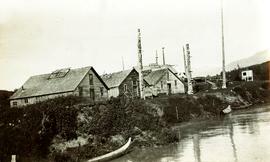 Canoes sit on shore in foreground beside village buildings. 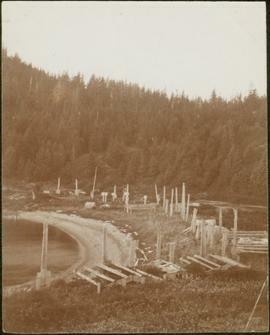 A dock is visible above water in background.Handwritten annotation on verso reads: "Alert Bay Indian Ranch No. 14 Alert Bay. To be shown on page 69 or 70, re Alert Bay Mission."